Epic Games Lead Game Designer Cliff Bleszinski is hoping for "fewer buttons on the controller" of the next iteration of the Xbox console. "This is purely me speculating in my own realm of game development, but if you look at a controller right now it looks like an alien spaceship," complained Cliffy B. With over a dozen buttons, the typical gaming controller can be seen as intimidating by newcomers. 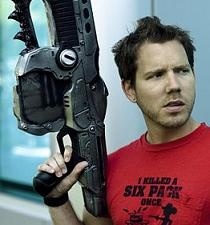 Besides reducing the button count, Cliffy B believes including other input devices will open opportunities. "I think you could do things with a built-in camera or a little motion sensitivity. You look at the Wii controller with less buttons - they added functionality by doing waggle. Not a lot of games use the waggle well, but Super Mario Galaxy for example uses it perfectly. Zak and Wiki uses it rather well," he said. "There are other ways of providing interactivity without having every single finger doing something at once on a friggin' controller." Motion cameras seem to be one solution Cliffy and his colleagues seem to be especially excited about. He explained, "I've seen some prototype camera stuff that some friends are working on that can actually tell the depth of the world around the player, and can track individual finger movements and stuff like that. That's exciting stuff, and I think that's where it all needs to start going towards."